coming off the best offensive season of his career, and now finds himself paired with Jarome Iginla and Alex Tanguay. I will never forget the scene. Draft day, June of 1995. Edmonton, Alberta. The names that quickly went off the board were Bryan Berard, Wade Redden, Aki Berg and Chad Kilger. Then the Tampa Bay Lightning selected Daymond Langkow and the roof nearly came off the then-Northlands Coliseum for the kid from nearby Vegreville who led the Western Hockey League with 67 goals and 73 assists in 72 games. "I saw you looking at his bio," Lightning scout Don Murdoch said. "It may say he’s 5-foot-10, 170 pounds, but I say this kid is more like Doug Gilmour ... plays like he’s 6-2, 220, strong as nails. "Every time I went to see this kid, two goals, three goals. But it was Daymond’s intensity, his guts and grit. Anybody takes a run at him, they're going to eat 18 inches of stick. The kid won't back down. It’s in his genes." Daymond Langkow’s dad, Randy, and his uncle, Grant, still can be found mucking and grinding in a senior league in Vegreville, where hard work and no-nonsense are the buzzwords and hockey definitely is a man’s game. Daymond’s dad is a plumber by trade and also helps repair air conditioners. His mom, Vivian, manages a small restaurant in British Columbia. They were living in nearby Edmonton when the middle of their three children was born. The couple divorced when Daymond was 10, but the roots were established. Ask where Daymond is from, and he’ll tell you Vegreville. For the majority of his NHL career, Langkow was seen as a “plumber,” a hard-nosed mucker who chipped in offensively, but was better known for checking and penalty-killing duties. But last season, Langkow had his best offensive season, posting career highs in goals (33), assists (44) and points (77), while going plus-23 for the Calgary Flames. Perhaps the offensive explosion was the result of playing with the offensively gifted Kristian Huselius. Whatever the reason, it worked. After six seasons in which he scored no fewer than 50 points but never managed more than 62 points – Langkow enjoyed his best season. The career year that the Albertan center put up last season has served as a stepping-stone to the start he’s having this season. Langkow has eight goals and seven assists in his first 11 games to rank among the NHL’s top 10 scorers for the first time in his career. 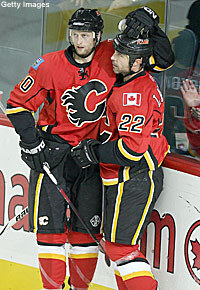 "Nothing’s going to change the way ‘Lanks’ always works hard and goes into the corners and battles, but ..."
Flames captain Jarome Iginla got a big smile on his face as he paused to think about the clever Huselius before he added, "Before I think the Flames’ mentality was being a straight up-and-down-the-wings team, but Kristian helped add a new dimension of creativity to go with the hard-to-play mentality we developed under Darryl Sutter when we went to the Stanley Cup Final in 2004. "Now, instead of dumping the puck in the corners and barging in after it, we’re a more diverse, more creative team. We’ll criss-cross at the blue line and carry the puck into the opponent’s zone. Try to do some of the things that make a big guy like Joe Thornton so effective, so deceptive; while still being strong on the puck and putting other teams on their heels." It’s not an old dog learning new tricks at 31 years old for Langkow. It’s just a reminder of the total package that he and the Flames have to offer. And it’s working under new coach Mike Keenan. Langkow, who already was a hard-to-move forward with quick hands, now is becoming more of a net presence. He’s dynamite in front of the goal, tipping in pucks, picking up rebounds or finishing off neat setups from Huselius. "Confidence is the biggest thing," Langkow said. "But it also helps when you’re out there playing along with guys like ‘Juice’ (Huselius) and ‘Iggy’ (Iginla) or ‘Tangs’ (Alex Tanguay), who are so unselfish. Chemistry is a big part of that confidence." And what about Murdoch’s “18 inches of stick” scouting report? "I thought I had a pretty good rookie season, but it was kind of all downhill from there," Langkow recalled of his 15-goal, 13-assist 1996-97 campaign in Tampa Bay. "It’s not that I didn’t want to score more goals, but my role just seemed to change." And his journey through the NHL began, from the Lightning to the Philadelphia Flyers and then the Phoenix Coyotes. But Langkow’s defensive play dramatically improved to the point where he was wanted for attributes besides a scoring touch. Langkow is beyond 30 now, but he is improving, and at 5-11 and 195 pounds, his size no longer is what stands out about his game. "When I first came into this League, I knew right away it would not be like juniors at all," Langkow said. "It's a totally different game. You have to make an adjustment and try to help the team any way you can. If the coach says this is your job, you do it. "All I heard leading up to the draft was that I wasn’t tall enough, big enough. Honestly, I still think if you're a good player, you're a good player. 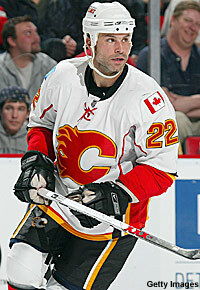 Guys like a Theo Fleury, Doug Gilmour and a lot of others made an impact for a lot of years, didn’t they?" It is, after all, the player who can adjust to the game and thrive that makes the best pro, isn’t it? "I traded (Oleg Saprykin and Denis Gauthier to Phoenix) for a solid, two-way character player who could strengthen us up the middle," Sutter said of acquiring Langkow. "We’ve still got that, but I just smile when I see ‘Lanks’ out there moving the puck back and forth with Kristian. "We definitely got more than I expected." "He scores on everything, so I better pass to him," Huselius shrugs. "I can’t describe it. We seem to read each other so well." "I don’t feel like a different player," Langkow said. "I still go out there night after night to compete. I always thought I could score a few more goals, but ..."
The quiet center’s thoughts stream off into the stratosphere someplace. Funny, but there were those in that Daymond Langkow fan club at the draft in Edmonton in 1995 who talked about this guy who used to walk the halls of his school and immediately attract the attention of the school bully. Fights and gaining respect were the major part of his resume off the ice. "Don’t believe everything you hear," Langkow said. "Stories tend to grow over the years." One story that has changed through the years is Daymond Langkow’s place in that 1995 Entry Draft behind Berard, Redden, Berg and Kilger. The long and short of it is that Langkow clearly is the warrior, the best all-round player of that group. Even if it has taken him 12 years to prove it.